Archives.com has over a billion records, and now it's easier than ever to find the one that you're looking for. We've updated the way we filter and display records so you're more likely to find your ancestor after just one search, and on the first page of results. In addition, we've added a +/- year option allowing Members to search by a particular date range. Example: if I didn't know my grandfather's exact death date, but knew it was within 2 years of 1993 I would search for "Robert Hill, Death Year 1993 +/- 2, Washington". This way an exact date isn't needed to run a successful search. We've also made it easier to browse records by letting you choose how many results you'd like to see displayed on a page. You can view as few as 10 and as many as 50 records at one time. We completed our first major makeover to the Archives.com Members Area. This new design utilizes more of the phenomenal content available on Archives.com. Members can access the latest Expert Series articles and Resources directly, view "New", "Updated", and "Coming Soon" Collections, as well as answer the fun Family History Poll. Have you seen the new design? If so, let us know what you think below with your comments. The design changes made to the Members homepage were extended to the entire Members Area. You'll notice an updated color scheme, which will make some text on the site easier to read. There were also many small improvements made to enhance site usability. We will continue this effort over the next couple of months--making even more updates and improvements as we grow! 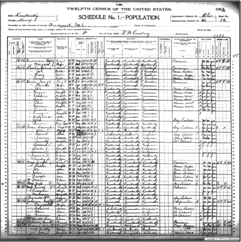 Addition of U.S. Census records and images! We've added over 200,000 census database records, and around 100,000 original U.S. Census images - now fully viewable to Archives.com members. 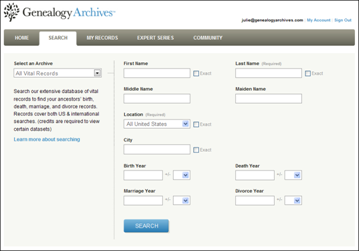 Archives is constantly adding more records to help members find ancestors and trace their family tree. Recently we added new U.S. vital records, and updated the U.S. Newspaper Obituary archive and the Social Security Death Index. There are other Collections that we are excited to integrate in the near future - including new U.S. Census images, U.S. vital records, international immigration records, and more. Any questions about the recent updates that we've made? We'd love to hear your impressions and gather your feedback. Please email us at feedback@archives.com with your thoughts!